Just want to take this opportunity to wish everyone Merry Christmas! 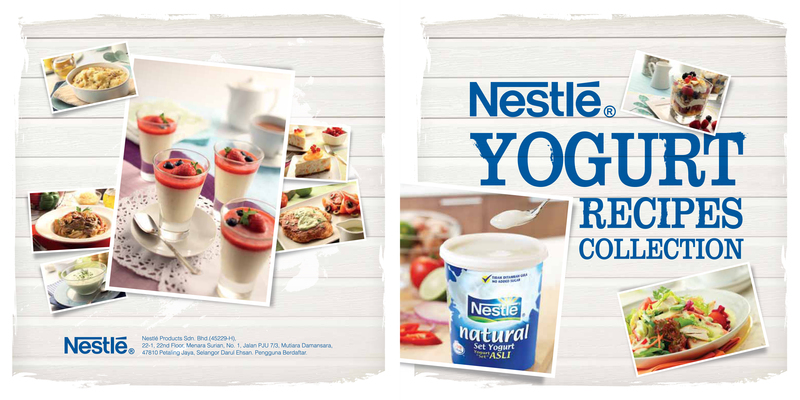 I finally received the photos of some of the dishes I styled for Nestle Malaysia for their plain yogurt recipe booklet a couple of months ago. I have not been able to grab a printed copy, can’t seem to find it in the supermarkets yet! I was told that they will be given away with purchase of Nestle natural yogurt at Jaya Jusco but I went to Jusco at MidValley and did not see it….If anyone sees it, let me know! Here are some of the pictures, please note that I only prepared and styled the food. Prop styling (even though many of the props are mine) and layout by the Art Director, and photography by another photography studio…There was a lot of effort spent in producing the dishes, photos and design, so I hope you’ll like them! Enjoy! And have a great Christmas holiday! Front and back cover of Nestle Malaysia’s yogurt recipe booklet, please note that I only styled the food for the photos on the back cover (left side), and the small photo on the top right of the front cover (right side) Photography by Studio TwentyTwelve.